An important travel hub for western France, Nantes Atlantique Airport operates domestic and international routes. 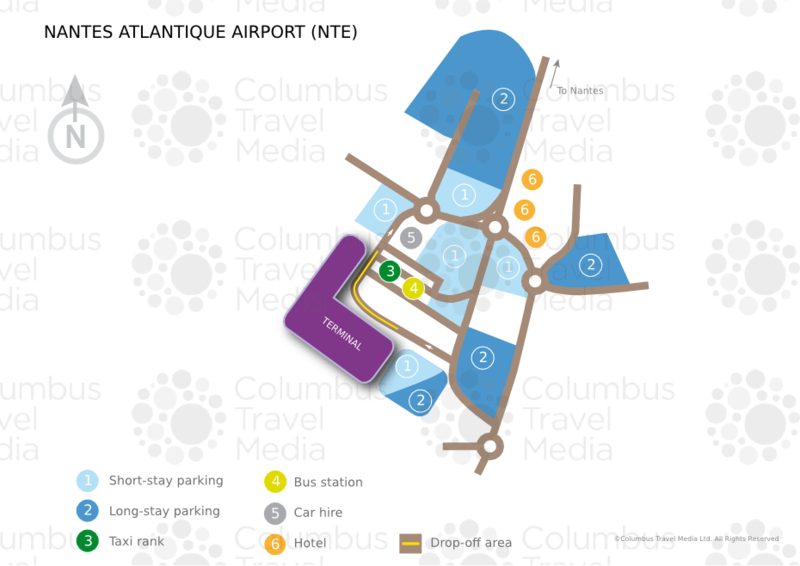 Our Nantes Atlantique Airport guide is a useful tool for visitors to the airport, with information regarding terminal facilities, public transport access and nearby accommodation options, as well as all the vital contact details. Construction of a new, larger, airport to replace the existing facility was scheduled to begin in 2014, but due to legal disputes the plans have been stalled. The new proposed airport site is located 30km (19 miles) northwest of Nantes and was initially scheduled to open in 2017 (delays are now very likely). An information desk is located on the ground floor in Hall 1, just to the right of the main entrance. From central Nantes, take the westbound D723 to the southbound E3 ringroad. Follow this road to the Grand-Lieu gate exit (51) and continue onto the D85, which leads to the airport entrance. The total drive time from the city centre is approximately 18 minutes. Nantes Atlantique Airport is situated in Bouguenais, 8km (5 miles) southwest of Nantes. Bus:The TAN Air Shuttle (tel: +33 240 444 444; www.tan.fr) bus links the centre of Nantes (SNCF station) to Nantes Atlantique Airport (journey time: 20 minutes; fare: €8). Alternatively, bus 37 stops outside Hall 1 and goes to La Neustrie terminus on tram line 3. From there, it's a short journey to Place du Commerce in the heart of the city. Shuttle:A number of shuttle minibus services operate between Nantes Atlantique Airport and destinations within the city centre, as well as to other nearby towns. Taxi:A taxi rank (tel: +33 2 4069 2222) is located on the esplanade opposite Hall 1. Fares to the city centre range from approximately €30 to €35, and the trip takes upwards of 15 minutes. There are self-service banking and bureau de change facilities in Halls 2 and 3 of the airport, as well as a staffed currency exchange kiosk in Hall 3. There is a brasserie restaurant, a bakery, a snack bar and three café/bars at Nantes Atlantique Airport. There are several shops at Nantes Atlantique Airport, including a newsagent/bookshop in Hall 2 and a duty-free shop in Hall 3 for passengers leaving the EU. Luggage trolleys are available throughout the terminal. For lost property (tel: +33 892 568 800), passengers should head to the reception desk in Hall 1 – left-luggage facilities are also provided at this desk. Other facilities at Nantes Atlantique Airport include a first aid station, baby changing facilities and a photo booth. Several meeting and function rooms (tel: +33 240 848 151) are situated within Nantes Atlantique Airport. These can host up to 200 delegates and feature video projectors and catering facilities. Conference and meeting facilities are also available at the Oceania Hôtel Nantes Aéroport (tel: +33 240 050 566; www.oceaniahotels.com) and the Hôtel Escale Oceania Nantes Aéroport (tel: +33 240 321 414; www.oceaniahotels.com). Free Wi-Fi internet access is available throughout Nantes Atlantique Airport. There are also four internet terminals: two in the main area, and two in the departure lounge. Telephones are dotted throughout the airport, and there is also a post box in Hall 2. Nantes Atlantique Airport is accessible to the physically disabled, with lifts, ramps and purpose built toilets throughout the terminal. There are also several reserved car spaces near the entrance of the terminal. There are ten car parks at Nantes Atlantique Airport, some dedicated to short-term parking (P2, P2 Est, P3 Est, P3 Nord and P3 Ouest), and some for more than five days (P0 Est, P0 Ouest, P1 Sud, P1 Est). The short-term car parks are located near the terminal building, as is the P4 covered car park with mixed rates. The long-term car parks are located a short distance away. Car hire at Nantes Atlantique Airport is available from Avis, Budget, Enterprise, Europcar, Hertz and Sixt. Service desks are located on the esplanade, which is right next to the hire car parking area.